“Hi there! I am Shivansh, a student at IIIT-Hyderabad. I am here with my first instructable which is a game inspired from Google Chrome’s Dinosaur Jump game. The game is simple: Jump across incoming obstacles in order to score a point. If you collide, you loose and the score resets. 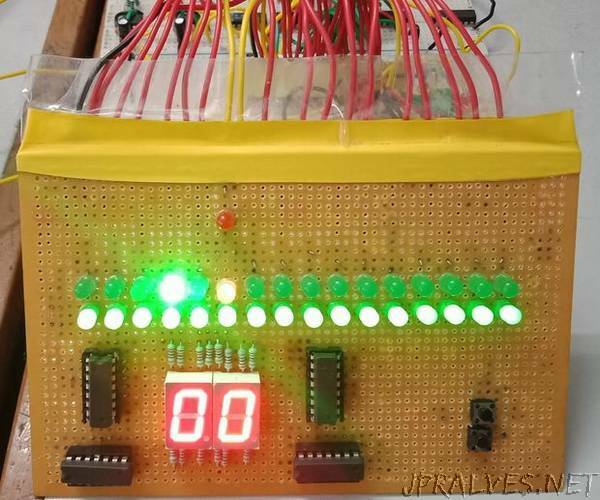 The highlighting feature of this project is that there is no use of an Arduino or any other microcontroller. It is purely derived from basic electrical components and involves the implementation of Finite State Machines (FSMs) with the help of logic diagrams, etc. Basic know-how about electrical components like Resistors, Capacitors, Integrated Circuits (ICs). Knowledge about working of Flip-Flop, Counter, Multiplexer, etc.